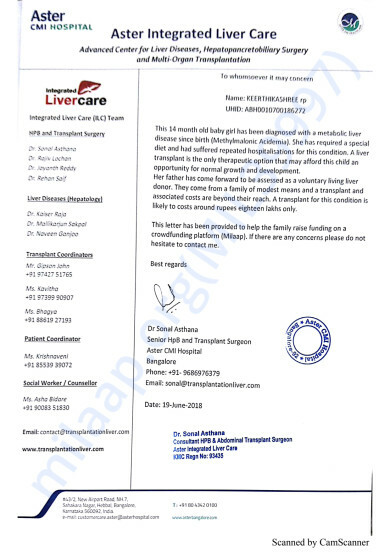 Keerthikashree who is 1 year 2 months Female is in a critical condition due to liver disease and the only treatment for her is a liver transplant. The total cost is around 18 lakh Rs. Please support. Thank you for the wonderful support that you have shown towards Keerthikashree. I have some unfortunate news to share with you today. She was diagnosed with a liver ailment. She was undergoing treatment for the same. 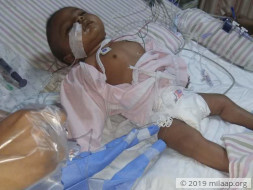 She was scheduled to undergo the transplantation procedure in a few days but she developed multiorgan failure. In spite of our best efforts, we could not save her. We thank you once again for the wonderful support that you have shown towards her. The family has requested for sometime in these difficult hours. The treating Doctor will share a note on the nature/cause of the death in a few days. In the meantime we are working with the finance team for any pending bills and we will keep you posted on the funds utilised and pending. Appreciate your understanding and patience. Please do pray for her soul to rest in peace. Keethikashree is showing some improvement in her health but requires more nutritional rehabilitation before she can undergo the transplant. Once she is ready we will keep you posted on the date. Thank you for your wonderful support. 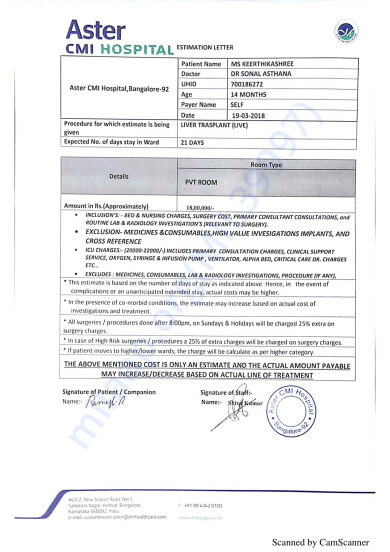 Here is a quick update on the Baby Keerthikashree's health. The baby was admitted to the hospital and was moved to the ICU as she had high fever, doctors have prescribed medicines to control her body temperature. According to the doctors, I can be the prospective donor as they have done all the test, however they will soon confirm about the same. We will go ahead with the transplant as soon as the baby's health condition is stable and donor work up is done.